Our friends at Hard Case Crime reprinted two of these novels toward the end of Crichton’s life under the Lange pen name, and have recently reprinted all eight for the first time under Crichton’s name. Grave Descend is the seventh of the Lange books. 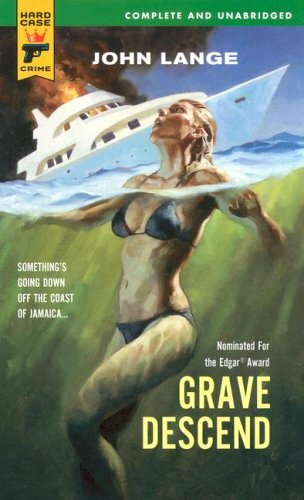 Grave Descend is an old-school pulp tale, at least a twenty-year throwback already in 1970 when it was published. John Lange doesn’t bother with character development, and that’s quite intentional. Our protagonist, James McGregor, is no white knight, but he’s being sucked into a plot by bad actors, and that’s all you need to know. Any more would leave less room for barroom brawls, ocelots, spearguns, alligators, gun battles, hammerhead sharks, explosions, femmes fatales, and ambushes in the book’s scant length. Lange has two goals–keep the intrigue up and keep the action moving, with an emphasis on the latter. He is also more successful at the latter, which helps a lot with the great flaws in the former. It’s a Saturday matinee cliffhanger serial for a slightly older crowd, designed to toss up excitement and plot twists at such a dizzying pace that there is little time to contemplate that the master scheme being executed behind the scenes is needlessly complicated and doesn’t make a lot of sense. This was a nominee for the Edgar Award, which might give you the impression that this is a great mystery. This isn’t a great mystery, or even a good one, but it is a lot of fun in this era of bloated page counts. Sometimes you just want a rollicking adventure, logic be damned. Grave Descend is definitely that. Yeah, that’s about what I thought, too. Neither of the Lange titles that Hard Case reprinted were all that good, but they were entertaining in a lightweight, plane-trip sort of way. About average for Hard Case’s reprint titles, actually, some of which are really good and some pretty weak. Aside from the Westlake stuff Hard Case put out, my favorites were David J. Schow’s Gun Work, Max Allan Collins’ The Consummata, which was finished from a Spillane outline, and is the second Morgan The Raider novel (I like the Morgan character better than Mike Hammer–maybe because he’s a criminal), and Roger Zelazny’s The Dead Man’s Brother, a long lost noir. Zelazny is one of my favorite Fantasy/Sci-Fi writers and his take on straight-up Noir is excellent. I really dug Charles Williams’ Touch of Death and Home is the Sailor by Day Keene.